Airfield Runway Merlot 2012 | Wine Splash! Merchandising and unique wine labels always catch my eye, but I rarely buy. I tried this Merlot at a wine tasting a few years back and was compelled to give it a solo flight this time and was glad I did! A nice ruby color in my glass with aromas of plum, dark berry, and fig. Medium to full bodied across the palate with good structure and soft tannins. Expressive flavors of ripe plum, blackberry jam, and sweet spice! On the second sip, more flavors of dark berry gained altitude along with hints of cranberry and toasted oak taking flight! A long, lingering finish lead to a pleasing soft landing. A great representation of a Merlot from Washington state! Pair with a hearty steak, pasta with a tomato meat sauce, grilled chicken, and medium to strong cheeses. 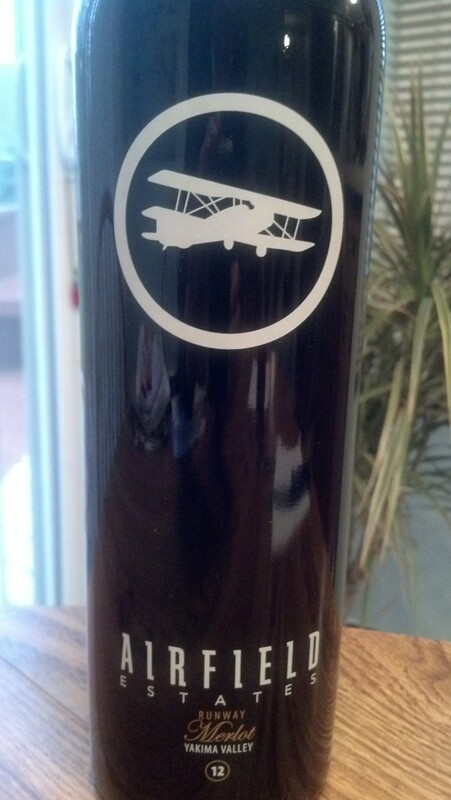 With this Airfield Merlot as your co-pilot, you will never get lost again. This wine really delivers and we give 90 WineSplashing points! Cheers! !